The Chillicothe Hornets used a vintage ground and pound offensive attack to beat Marshall 63-7 in the 2016 season opening football game at Jerry Litton Memorial Stadium. It was all Chillicothe the rest of the first half with three touchdowns in the 1st quarter and three more in the second quarter to lead 42-0 at intermission. The hard hitting Hornets defense held Marshall to 18 yards passing and a minus 14 yards rushing in the first half. In the second half, Junior FB Josh Kille took the Hornets handoff 89 yards on the first play for six. On Marshall's first play, a running back picked up a bad snap of the ground and ran 80 yards for their only score of the night. 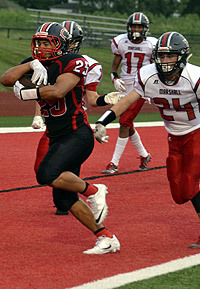 In a running clock the second half, Chillicothe scored again in the 3rd and early in the 4th quarter. The 63 points were the most scored by Chillicothe since 1998 and the Hornet Defense held Marshall to just 2 first downs.